Former Thunderbird defensive tackle Robert Torgerson will get his shot at the National Football League this season, as he’s been invited to participate in rookie minicamp with the Jacksonville Jaguars. 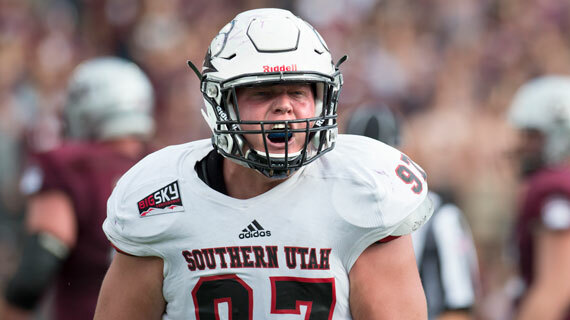 The Thunderbirds now have two former student-athletes getting a shot to pursue their NFL dreams, as Mike Needham was signed by the Arizona Cardinals as a free agent. In 2016 he led the team with 12 tackles for loss and five sacks. He also finished that season with 33 tackles. He had similar numbers in 2014, compiling 10.5 tackles for loss, six sacks and 30 total tackles. Requiring a double team most of his senior season, Robert Torgerson had 3.5 tackles for loss and a sack this past season, and led the team in the quarterback hits category. Following the 2017 season, Torgerson was named to the All-Big Sky Second Team. Track the Thunderbird football team 24/7 by following @SUUFB on Twitter and Instagram and by liking the Southern Utah Football page on Facebook. Season Ticket Renewals are now available for the 2018 season. Visit www.tbirdtickets.com or the America First Event Center Ticket Office for details. Ticket Renewals are due June 1st, at which point they will be open to the general public.